Barrett provides portable HF radio equipment for specialist rescue team. The WMFS Service is the second largest fire service within the United Kingdom and are responsible for the coordination of communications element of UK International Search and Rescue (UKISAR). In larger emergencies, voice communication to and from outside the impact area is critical. In identifying the need to further strengthen their communications with High Frequency (HF) capability, WMFS contacted Barrett Communications about the Barrett 2050 Rapid Field Deployment System (RFDS) and other portable HF systems to provide their team with communications in these emergency environments. HF radio communications is often used by first responders to natural or man-made disasters where normal communications infrastructure has either been destroyed or disabled in the disaster. With the exception of the initial capital cost, HF systems are infrastructure independent and free to air with no ongoing call costs. The WMFS are part of the larger International Search and Rescue Team (ISAR), a group known for their global response to natural and man-made disasters and are often called upon by governments in extreme situations. 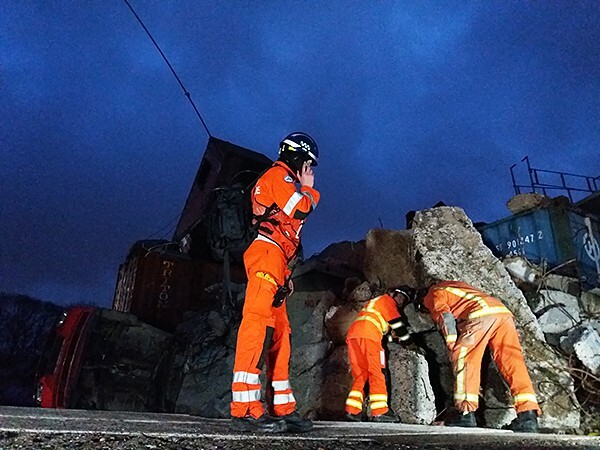 As part of their ongoing training, WMFS were recently involved in the Modex Exercise 2 in Falck Denmark – Langvang, where the exercise scenario was a major earthquake with numerous powerful aftershocks which had devastated the region of Langvang and the busy town of Falck. The exercise took place over 4 days in below 0°C conditions. The Barrett RFDS was deployed as part of the UK communications system and provided communication back to the response headquarters in Falck. Two of the WMFS rescue specialists wore the Barrett 2090 HF manpacks which allowed them to provide minute by minute updates on the rescue situation.